The new Fire-i 830c color firewire industrial camera incorporates a 1/1.8″ 2 Mpixels Wfine, progressive scan CCD and is housed in an ultra small and lightweight industrial housing. CS and C-mount lens support. 1600 x 1200 square pixels. Frame rates: 16, 7.5, 3.75, 1.875. 8 bit or 12 bit color RAW & YUV 4:2:2, synchronization by 1394 bus. Software or hardware trigger, modes 0-5, 14, 15. Gain Control: 0 ~ 27 dB / S/N ratio: 56 db or better. Shutter Speed: 1 usec – 3600 sec. Size: 29 x 29 x 38 mm, Weight: 63 gr. One 4.5 m (15 feet) 6p to 6p cable. 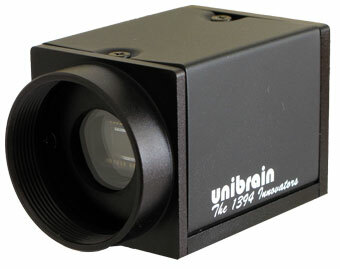 Unibrains Fire-i API™ software development kit. The new Fire-i 830b monochrome firewire industrial camera incorporates a 1/1.8″ 2 Mpixels Wfine, progressive scan CCD and is housed in an ultra small and lightweight industrial housing. The new Fire-i 530c color firewire industrial camera incorporates a 1/3″ VGA Wfine, progressive scan, color CCD and is housed in an ultra small and lightweight industrial housing.